Yeah. My dad is grossed out by the gecko, and he said snakes are the WORST! Could you guys attend some reptile show together? I don't know whether it would help your dad seeing how others feel about leos and corn snakes. I don't know if there are any near us. I might take my dad to the pet store ( not petsmart) and show him the different animals. There is this show on August 24, 25 2019. 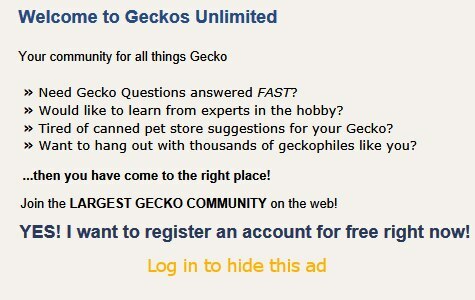 So maybe it will just take some time to show her that your interest in the gecko is not going away just because you want a snake. Convincing your dad might be a lot harder. Some people really do have bad phobias. Can you convince your dad that your snake would be safely enclosed in a tank, and that you would only handle it in your room with the door closed, so that there is NO CHANCE of escape? Show him photos of the tank you would buy - including lock mechanism!, and that you will save up the money for all supplies ahead of time, that you are caring for your gecko properly and plan to continue to do so. Parents also worry about what happens when their kid gets a pet and then they get to be teenagers and have other interests (like dating, etc.) that take up their time other than pets. Your pets would have a long lifespan. Your parents want to know they will not be taking care of it at the other end of its life. It may take some time. Do be considerate of their feelings, and above all, DON'T NAG OR ARGUE! You can present your wishes, and if they are turned down, ask if you can discuss it again in three months, so that they can see you are serious but are not being a "whiny little kid". Parents always want their kids to grow up to be responsible. It sounds like you are well on your way to that, now just to keep showing them. Good luck! Oh yeah, before, I wanted a turtle, then tortoise so my mom must have gotten really angry when I said I wanted a snake. She says I will lose interest in the gecko, but I will make sure that will not happen and he wont be neglected. one important consideration: the snake will still be likely to have another decade or more of life when you reach adulthood and move out. finding a place to live when you are young and have pets can be very challenging. also, if you decide to go to a university most dorms do not allow pets at all. I know it's hard to wait and be patient, but I would advise waiting until you're on your own and can do this yourself, and are in a position where you won't be forced to choose between your pet and other important things in your life. to continue to learn and be engaged, I would also offer a few suggestions: 1. if there's a herpetological society near you, go to meetings. talk to other people that keep reptiles. also, 2. if you can connect with an adult in your area that keeps reptile pets, maybe help care for their animals and that way you can learn more about different species and what's actually required over the long term. I love that you're putting so much thought into this! Last edited by GeckoLeen; 12-22-2018 at 09:51 PM.